Foreign Minister Mohamed El-Orabi announced Egypt’s recognition of the newest state, the Republic of South Sudan. El-Orabi spoke to Al-Ahram daily upon arrival last night at Juba Airport as part of a senior Egyptian delegation headed by Deputy Prime Minister Yehia El-Gamal and includes Minister of Electricity and Energy Hassan Youssef. “South Sudan is a strategic asset for Egypt, which we cannot neglect or abandon,” he said, emphasising that Egypt will play a leading role in supporting stability in South Sudan. “This does not mean that we are taking sides, but that our relationship will be balanced between the North and South,” he added. El-Orabi said that Egypt will mediate to resolve any disputes between North and South, and that Cairo has prepared not only a foreign policy but also a development plan for South Sudan, such as in the sectors of electricity, agriculture and others. El-Orabi described the declaration of independence of South Sudan as a historic event and expressed his pleasure in attending celebrations marking the occasion. 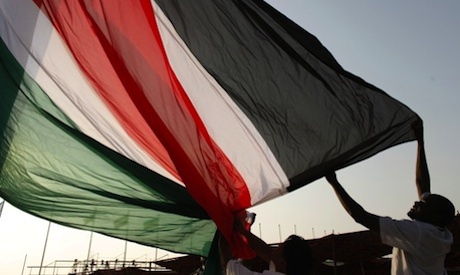 South Sudan recently voted to secede from Sudan after a bloody civil war. Egypt and the remaining part of Sudan should join to form a new nation which will be self sufficient in food, industrial and military needs and will become one of the greatest nations of Africa and Arab-Islamic region.